Whether you eat plant-based full-time or want to go meat-free once a week, Tonight We Veg will bring you the feel-good vegetarian meals you crave. Twice a month, in addition to our existing lineup of great veggie recipes, we鈥檒l share easy weeknight recipes that prove how diverse produce-forward food can be, each packed with smart tips we鈥檝e picked up over the years. Cook along with us, and share your creations using #tonightweveg. I truly can鈥檛 remember ever eating cauliflower as a kid 鈥� except, maybe, as part of a frozen vegetable medley we steamed in the microwave. But in recent years the unassuming veggie has experienced a resurgence, if you will. There are now so many ways to prepare it that half the time, you probably don鈥檛 even realize you鈥檙e eating it. I like it mashed, and riced, and crisped into a pizza crust. But I actually enjoy cauliflower the most when it鈥檚 not masquerading as something else. Here, super-crispy florets get tossed in hot sauce for a bite-sized bowl topper that鈥檚 utterly crave-worthy. The first time I made Buffalo cauliflower bites, I discovered that most recipes are designed to mimic restaurant-style Buffalo chicken wings 鈥� the florets are dredged in egg, dipped in flour or panko, then baked or fried. Not only was this a lot of extra (very messy) work, but it also gave way to gummy cauliflower that was a far cry from the crispy bites I was going for. But this version is so much easier: Just cut a head of cauliflower into bite-sized florets, drizzle with olive oil and seasoning, and roast at 475掳F for about 15 minutes. Then remove, toss with hot sauce, and return to the oven until hot and crispy. This technique 鈥� roasting the florets first and then tossing with sauce 鈥� prevents sogginess, and is the best way to get crispy cauliflower no matter how you鈥檙e flavoring it. Pile into tacos, dip into ranch, or serve as part of this (vegan!) grain bowl. 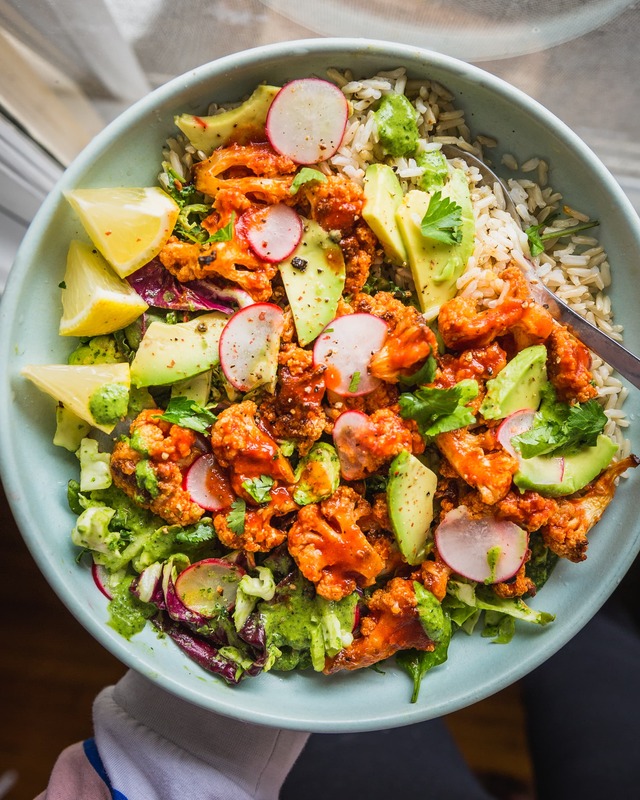 To complement the crispy, spicy cauliflower, I packed this bowl with cooling avocado and a creamy tahini dressing. Anytime I鈥檓 using tahini, I typically add a little olive oil, lemon juice, and warm water to make it thin enough to drizzle. Just one extra addition 鈥� a generous handful of herbs 鈥� gives it a gorgeous green hue and a boost of fresh flavor. Here, you鈥檒l toss the sauce with store-bought slaw and drizzle it over top of the cauliflower, but if you make a double batch, enjoy it with falafel, as a dipping sauce for summer rolls, or to dress any number of salads. Arrange an oven rack in the lowest position and heat to 475掳F. Place the cauliflower on a rimmed baking sheet. Drizzle with the oil and season with the garlic powder, salt, and several grinds of pepper. Toss to coat and arrange in an even layer. Roast, tossing halfway through, until beginning to brown and crisp, 13 to 15 minutes total. Remove the cauliflower from the oven. Pour the hot sauce over the cauliflower and use a spatula to toss until evenly coated. Return to the oven and roast until crispy and warmed through, 5 to 7 minutes more. Meanwhile, make the green tahini. Place the herbs in a food processor fitted with the blade attachment and pulse until coarsely chopped, about 10 pulses. Add the tahini, lemon juice, oil, 2 tablespoons of the water, salt, and several grinds of black pepper. Process until smooth, about 1 minute. If tahini is too thick to pour, add the extra tablespoon of water and process until smooth. Place the slaw mix in a medium bowl, drizzle with half the tahini sauce, and toss to combine. Divide the dressed slaw and brown rice among 4 shallow bowls. 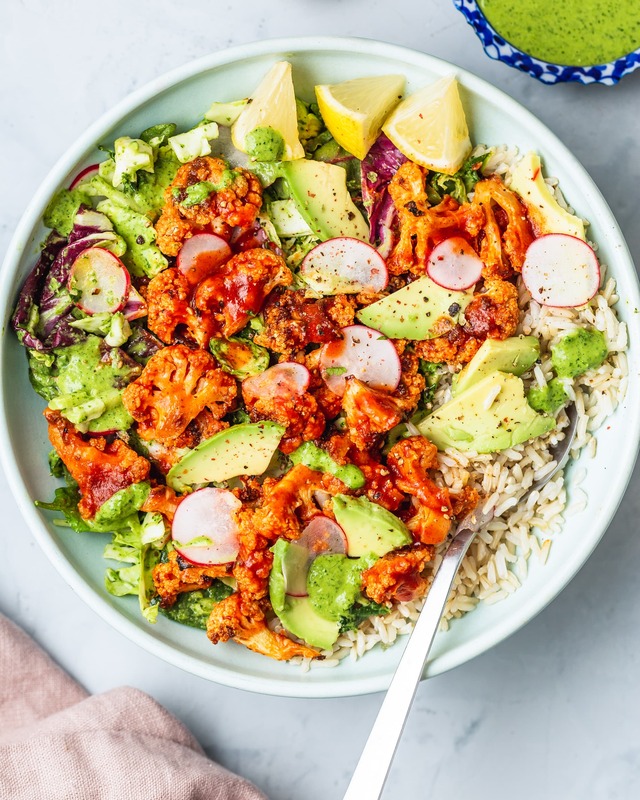 Top with the cauliflower and avocado. Drizzle the remaining sauce over the bowls and finish with sliced radishes, if using. Storage: Leftovers can be refrigerated in an airtight container for up to 4 days. Store the sauce in a separate container.